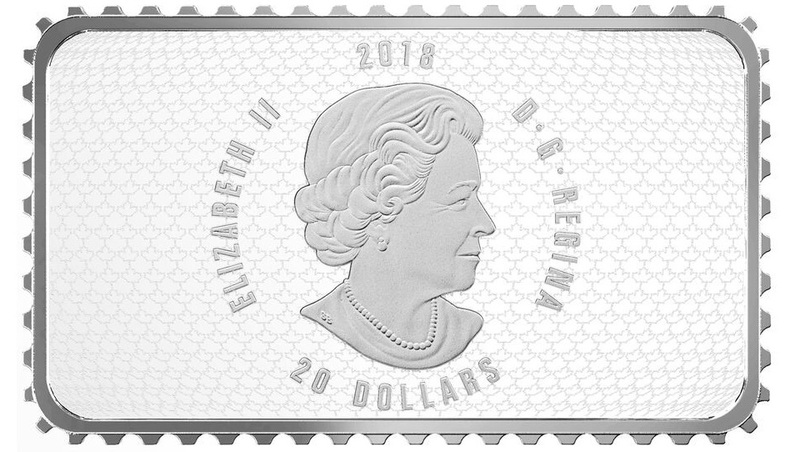 The Royal Canadian Mint has launched a new series of coins which cleverly recreate some of the country’s most memorable stamps of the early 20th century relating to national anniversaries or services. The new rectangular-shaped coins, which include a total of three designs, distinctly recreate the look of real postage stamps. Each reverse design is a finely engraved, coloured reverse, which is every bit as detailed as the original stamp issues. 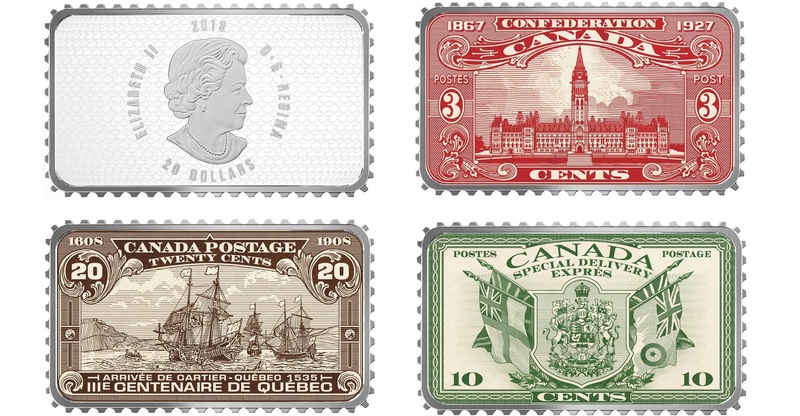 The coins are a fitting tribute to Canada’s postal and philatelic history. 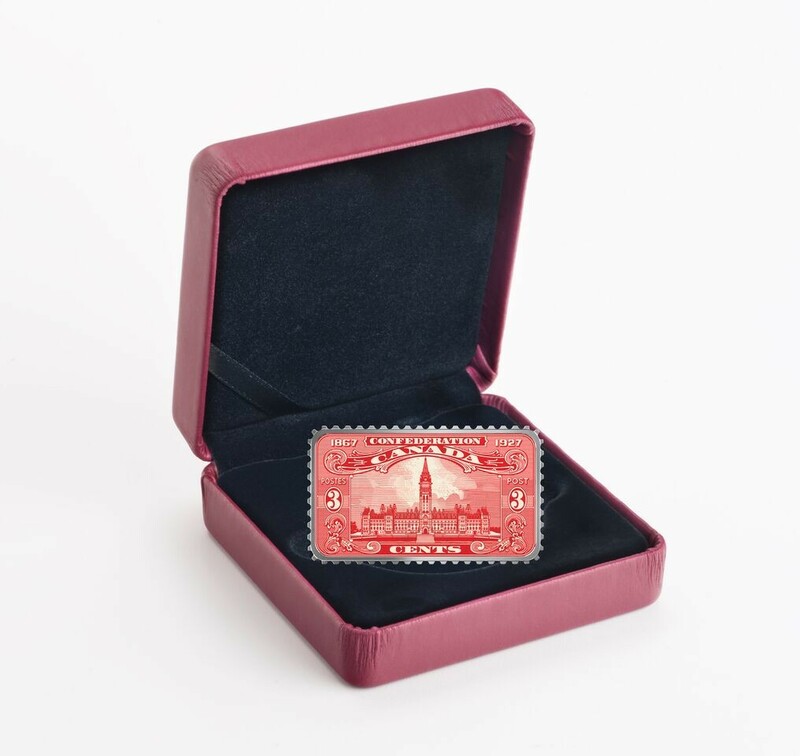 The first of these stamp-shaped coins features a design on the reverse which is a detailed reproduction of a Canadian postal stamp issued on the 29th June 1927, that was to commemorate Canada’s Diamond Jubilee. Titled Centre Block of the Parliament Buildings, the original design by Herman Herbert Schwartz and engraved by Harold Osborn, features a front view of the Peace Tower and Centre Block building on Parliament Hill, in Ottawa. The three-cent stamp was printed using the traditional intaglio, or engraved line process, as evidenced by the horizontal lines recreated on the reverse. Aside from the edges of each coin, which replicates the perforations seen on most stamps, the reverse includes a faithful application of modern colour that recreates the rich red hue of the original issue. The double dates 1867 and 1927, and the word CONFEDERATION, reflect the 60th anniversary of Confederation. 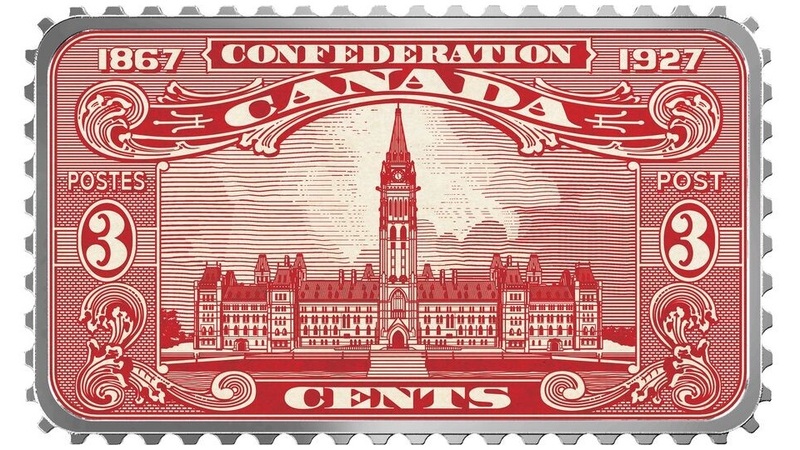 Like the 1927 stamp, the reverse includes ornamental flourishes and the word CANADA on a scroll banner, along with POSTES, POST, and the face value, represented by the number 3 and the word CENTS. Each coin is specially encapsulated to accommodate its rectangular shape and is presented in a custom branded Royal Canadian Mint case, accompanied by a numbered certificate of authenticity. The three-coin set will be available by subscription, or separate purchase, and will include: Parliament Building 1927 Confederation, Arrival of Cartier Quebec 1535 (available October 2018), and the Coat of Arms and Flags Special Delivery (available December 2018). For additional information about these coins and others from the Royal Canadian Mint, please visit their website. But should I add it to my stamp or coin collection?